As David Cameron prepares to promote yet another housing boom in Britain, we would do well to pay some notice to our neighbours in Spain, who are currently suffering the dire consequences of a bursting bubble releasing its slime all over their lives. When all else fails (and it’s hard to think of much that’s not failing under Osborne) a housing bubble can do wonders for a dismal government. From the mid-1990s until the late 2000s, the fantasy of permanent expansion served subsequent Spanish governments well, with GDP growth remaining around 4% and an unemployment rate that was slashed by half in less than a decade. Asides from a generalised concern with the environmental devastation caused by this hyper-accelerated development (especially around the coastline, where even the Brits’ appetite for “villas” was quickly over-satiated), no dissenting voices made it onto the mainstream. “Spain is going well” became the catchphrase of the noughties, needless to say such triumphalism was short-lived. Housing became the canary in the mine. In this land of fictitious plenty, “renting was for losers”, but as prices escalated and social provision shrank, those who were either reluctant or unable to mortgage their lives in order to access a basic right began to organise.1 By the time the bubble burst the support networks were already in place. 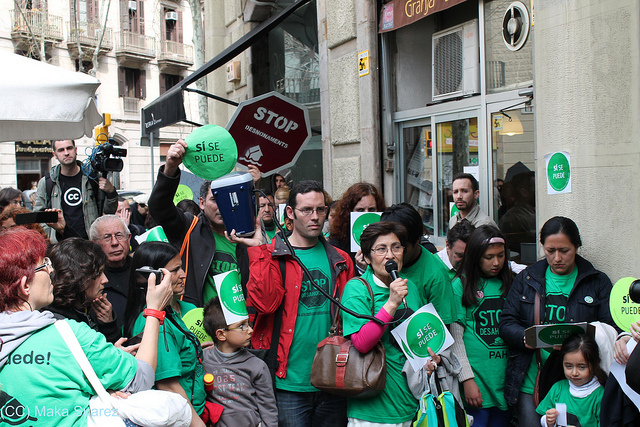 The PAH––the Platform of Mortgage Victims––was set up in Barcelona in 2008 bringing together pre-existing groups in order to respond to a new landscape of economic devastation: a combined steep rise of interest rates and unemployment that had left thousands of families unable to face their mortgage repayments and facing destitution.2 Draconian repossession laws in Spain so disproportionally protected the mortgage lenders that those unfortunate enough to lose their homes were also burdened with a debt for life.3 Until 2011 they allowed banks to take a mere 50% of the value of the property into account when offsetting the debt; this was then reluctantly raised to 60%.4 By the time interests, penalties and legal costs had been taken into account, a great deal of borrowers found themselves both homeless and owing the full cost of their mortgage. Lest we forget, these are the same banks that had accepted hundreds of millions in state subsidies. Between 2002 and 2008 a staggering average of 754,000 new homes were built in Spain every year. It is currently estimated that up to 6 million homes remain vacant. And yet, the state has simply given up on those who find themselves without a roof. Faced with the prospect of imminent eviction, an alarming number of people are committing suicide, providing a stream of wretched headlines that has lent a dramatic urgency to this problem. “There are lives at stake” the PAH reminded us. It soon became obvious that for the government, protecting the banks’ cooked books had taken precedence over the lives of its citizens. There is a grim cautionary tale here, do not believe for a moment that there is a correlation between promoting homeownership and safeguarding access to housing; there ain’t. In 2010 the PAH was among a group of organisations that launched a popular legislative initiative, or ILP, to demand to parliament the regulation of the datio in solutum (in which the house is used as collateral to cancel any outstanding debt), an urgent stop to residential evictions and adequate provision of social housing and affordable rents. These measures have gained the support of over 80% of the population, cutting across all party lines (mortgages are clearly not the preserve of the left). Last February, the PP government announced they would refuse to allow the motion into parliament, performing a spectacular U-turn after just two hours and a huge media backlash. Barely a month later, a landmark victory at the European Court of Justice ruled against Spain’s mortgage lenders, deeming that they offered insufficient protection to holders and granting courts the right to stop repossessions while abusive clauses are being scrutinised. And yet, evictions are continuing under a cloak of dubious legality, and the ILP has suffered so many amendments on its way to being voted in parliament at the hands of the ruling Popular Party (PP) that it hardly resembles the original. So what now? This is a government that has broken all its electoral promises, a Troika-led technical government in all but name, facing extremely serious corruption charges (even among the generalised landscape of political corruption in Spain) and stubbornly refusing to listen to its citizens. A government, in short, that has unveiled the radical inadequacy and underlying tyranny of so-called liberal democracies. “Real Democracy Now”, the chant of the 15-M has turned into a clamour. With an electoral system that allows little room for real alternatives, the main opposition party, (called The Spanish Socialist Workers’ Party––make of that what you will) was fully complicit in creating the context that has led to the current crisis.5 “We want all of them to go” became another slogan. The problem is not this government; it is the form of government itself. After a civil war and 35 years of dictatorship it was hammered into us that we should thank our lucky stars for our “smooth transition to democracy”. For the first time ever, Spaniards are raising their voices against this all-too-smooth transition and demanding the democracy they never had. Enter the escraches. PAH activists have developed a nation-wide network of assemblies and online tools to protect those at risk of homelessness; their rapid response to eviction notices has stopped hundreds of repossessions by gathering citizens who physically stop them taking place. These scenes are truly moving, showing communities in the process of reinforcing their links and discovering their power. The disdain of a Mickey-Mouse government was never going to stop them. Escrache was the name given to the protests staged in Argentina during the nineties against the impunity granted by Menem to Junta collaborators. Faced with a law that protected assassins, activists took to congregating around their homes, chanting and publicly shaming them. The idea was simple: you might no longer be legally responsible for your crimes, but we are still holding you ethically accountable. In its Spanish iteration, escraches have a different inflection. Given the extent of “marching-fatigue” in the country, the fact that all legal steps have already been exhausted and the refusal of MPs to meet with the PAH, the PAH has decided to go to them. Again, the idea is simple, activist approach MPs that are planning to block the ILP wherever they are (at the airport, in their neighbourhood, in their houses) and deliver first-hand accounts of what it’s like to become a victim of mortgage fraud and how the ILP would help them.6 Some were concerned about their similarity to say, the pickets at abortion clinics. Isn’t it simply wrong to make these things “personal”? It is worth remembering that Spanish MPs do not hold constituency meetings. Once the campaign trail is over, there are virtually no opportunities for citizens to meet their putative representatives. There are, nevertheless, strict guidelines regarding how escraches are to be conducted.7 It is personal, but non-coercive––all things considered, very civilised. Well, no, not quite. The police have acted with characteristic lack of finesse during the escraches, injuring several activists and arbitrarily detaining many more. All police stations received a government memo advising them to register the ID of all who took part in escraches, only for the judicial power to remind them that such policy would be illegal. Nevertheless, as I write further measures of dubious legality (an expression I use most euphemistically) have been announced on the press, such as preventing protests from taking place less than 300 metres away from politicians’ houses (!) and abusive fines for 30 activists who took part in a escrache at the vice-president’s house, the most high-ranking politician to date to have received a visit from the PAH (hierarchies, it seems, are an all-too-present consideration when assessing the criminality or otherwise of these acts). The PP has started an outrageous campaign against the PAH. Enraged by the popularity of the movement and the nation’s love affair with Ada Colau, its spokesperson, they have resorted to calling her a “terrorist” (ETA being the nation’s favourite all-purpose bogeyman), and a “nazi” (yes, you can get away with that in Spain). While such attacks are abominable, what is truly striking is the sheer formalism of the arguments for the defence. Reluctant to get into too much detail about the rights and wrongs of their behaviour, MPs have gone straight for the last resort, entrenching themselves behind a bulwark of parliamentary “legitimacy” in order to admonish the PAH: “we are the rightful representatives of the people” and “you have transgressed a limit”. Truth be told, the PAH has not transgressed a limit, but they have certainly pointed to it. This “we” is adamantly impersonal, the abstract remainder of a long-broken pact, this “you” stands in front of the overwhelming majority of the population. When a government can offer no other proof of its legitimacy than the fact that they have been voted in, they unwittingly point the finger to the very mechanisms that allow for such an aberration. The PAH––this unlikely alliance of activists and mortgage-holders––has managed to get to the root of the problem in record time. Playing by the current rules, “whoever wins, we lose”, nothing short of a radical reconfiguration of the current system will ever suffice. While the enormity of the task is daunting, the PAH has offered an object lesson on hope: “no, they don’t want it to happen”, but “yes, we can”. 1. See Ada Colau and Adrià Alemany book Vidas Hipotecadas (mortgaged lives), available in Spanish here. 2. To give a sense of the scale of the problem, in 2012 there were 517 repossessions per day in Spain that is more than five times the figure in the UK. 3. This has had the inevitable side-effect of forcing thousands to rely on hand-outs, NGOs and state support. Unsurprisingly, local authorities have been quick to lend their support to the PAH, raising their voice against current laws and in some cases, using their legal powers to stop evictions. 4. In a stagnant housing market, with houses which had been exorbitantly overpriced by the banks themselves, lenders are frequently using a loophole to avoid going that far, using proxy companies to bid for the homes they are repossessing at below 60% of their value. 5. The latest polls have demonstrated a complete lack of enthusiasm for any of these parties, with their combined supporters amounting to less than 50% of the voting public. 7. They include absolutely no violence, no insults, and utmost respect and concern for the welfare of any children that might be present.